RAWALPINDI (92 News) – British Army Chief of General Staff General Sir Nicholas Patrick Carter called on Chief of Army Staff (COAS) General Raheel Sharif in Rawalpindi on Wednesday. During the meeting, matters relating to regional security issues and mutual interest were discussed. The visiting British Army General acknowledged the sacrifices and achievements of Pakistan Army in fight against terrorism and efforts for bringing peace and stability in the region. Earlier, on arrival at GHQ, General Sir Nicholas Patrick Carter laid floral wreath at Yadgar-e-Shuhada. A smartly turned out contingent of Pakistan Army presented the guard of honor to the visiting dignitary. 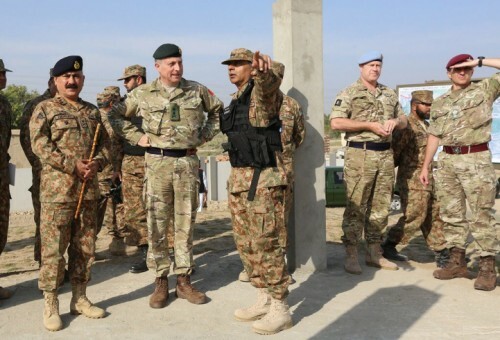 Later, UK Army Chief of General Staff (CGS) Sir Nicholas Patrick Carter visited Miran Shah in North Waziristan area. During his visit to Meeran Shah, the formation commander briefed Sir Nicholas about the situation of the tribal area. He also briefed the UK CGS about the return of temporarily displaced persons (TDPs) and the development projects initiated by the Army in the area.